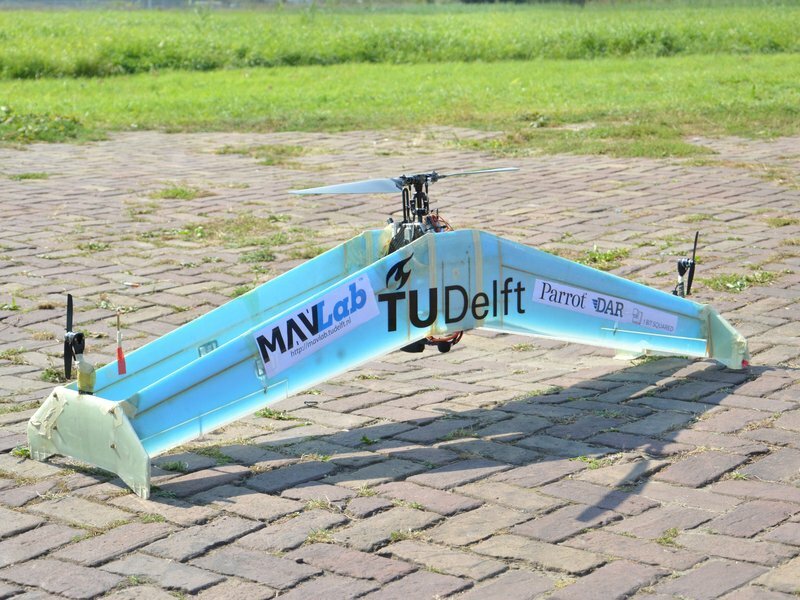 Researchers from TU Delft’s Mavlab scored a second place and won the Airmanship award at Australia’s UAV Medical Express Challenge in the last week of September 2016. It was the first time their brand new hybrid drone, the biplane helicopter named ‘delftAcopter’, was put to the test. The delftAcopter will be further developed and tested for applications such as providing medical aid in difficult to reach areas. The new unmanned aircraft takes to the air like a helicopter before completely tilting 90 degrees and then flying horizontally like an aeroplane. The biplane helicopter has one main rotor and two engines on the tips of its wings. What makes it so innovative is the use of a tailless double-decker wing with a helicopter propeller, put in optimum configuration during take-off, when hovering and during flight. Thanks to its design, the delftAcopter, with a wingspan of around 2 m, can both hover in the air and fly at speeds of up to 100 km/h. It can fly as far as 60 km. In addition, this lightweight drone, weighing around 4 kg, can fly for a whole hour completely on electric power. "The team stayed focussed even in the full stress of the competition"
Team delftAcopter was selected as one of the 10 finalists of the UAV Medical Express Challenge. The challenge: autonomously find ‘Outback Joe’ in an area that is cut off by floods, collect his blood sample, and fly it back. The challenge proved extremely difficult this year: no team managed to complete the challenge, but a few teams came close. Team delftAcopter came second, and was also extended the ‘Airmanship award’ for proving to be a ‘well organized team that stayed focusse even in the full stress of the competition’.